- BED & BREAKFAST and HALF BOARD. - AC, TV, FRIDGE, TEL. - ADULTS ONLY (+ 16 years). GR. Cat. : A' Luxe Hotel. 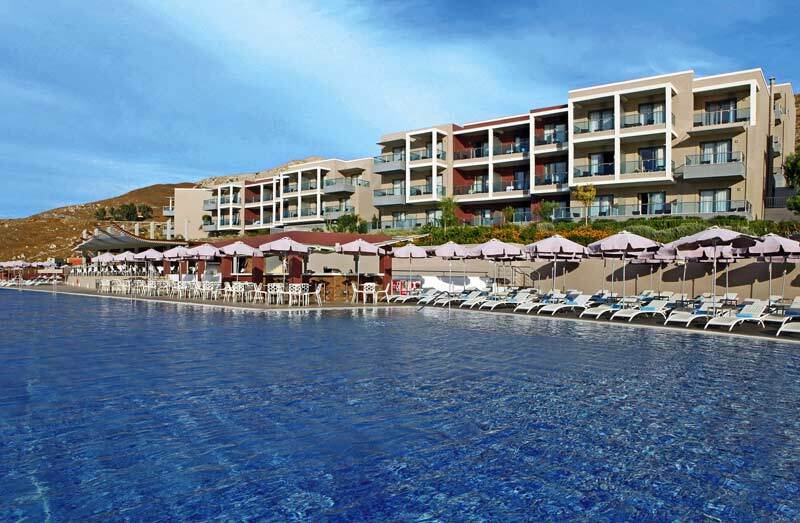 Nestled on the famed coast of Agios Fokas on the Island of Kos and a 30 min drive from KGS airport, our luxury beachfront resort offers superb views to the Aegean Sea. 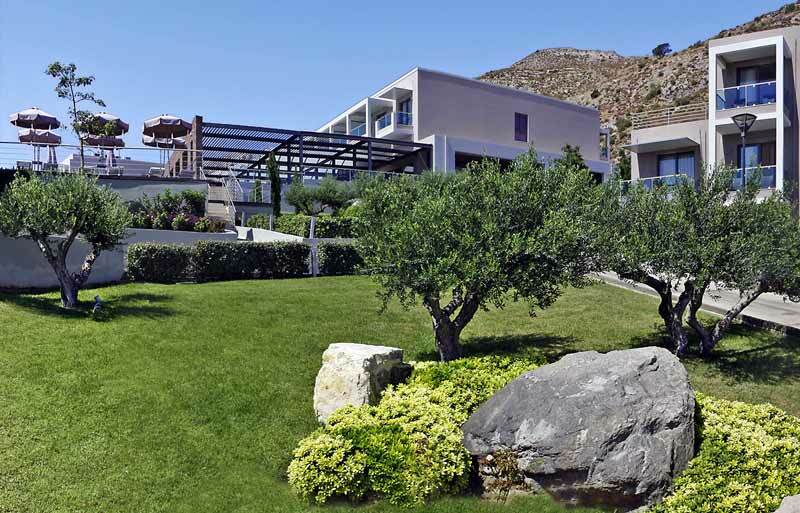 A luxury resort in Greece with exceptional charm, architecture and style, Michelangelo Resort & Spa is the perfect hideaway to combine elegant accommodations, the finest cuisine and a soothing retreat for the senses. Bus: A public bus stop is just outside of the hotel offering shuffle every 15 minutes to the town of Kos. Taxi: Our front desk may call for taxi service anytime during your stay. Car & bikes: Our guests may rent car or bike during their stay. Kos maps are available in our reception. Our standard double room features mountain or hotel views and is approximately 25 m². It has elegant decoration with calm colors and a peaceful atmosphere. It sleeps up to 3 guests. 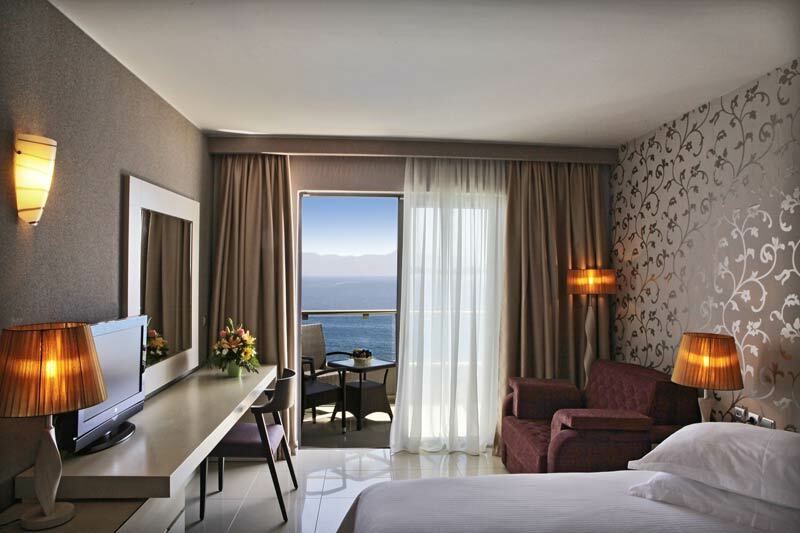 Superior room offers magnificent sea views of the Aegean Sea and its décor and occupancy is identical to standard double room. 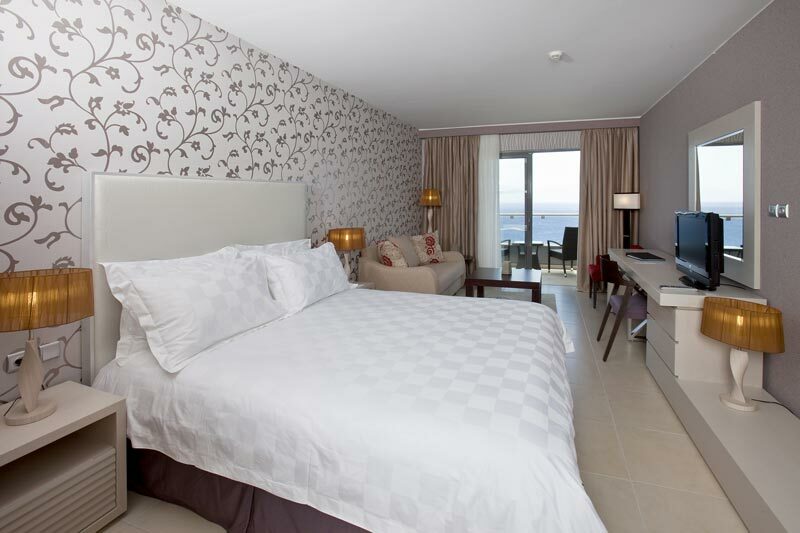 These beach front rooms are situated in the first row of the hotel overlooking the big blue sea! Their décor and occupancy is identical to standard and superior rooms. 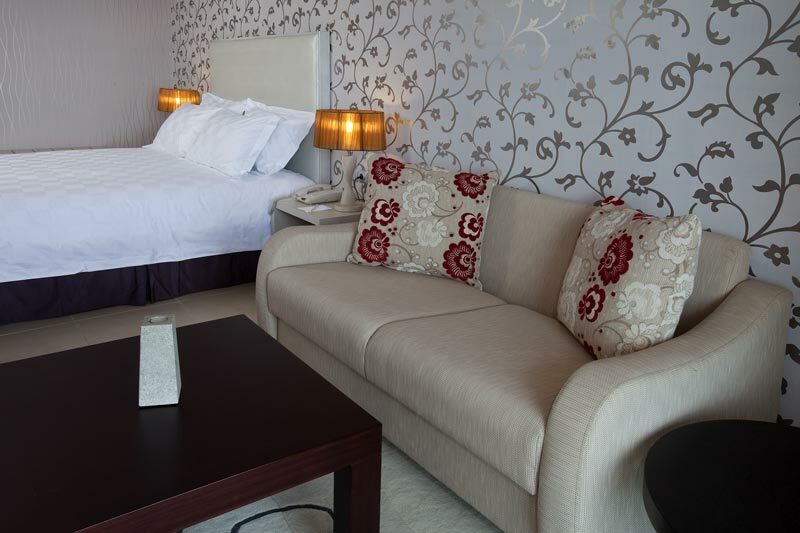 Michelangelo junior suites offer similar decoration to our double rooms plus a more spacious sitting area. Their occupancy is up to 3 adults and they all face the Aegean Sea. 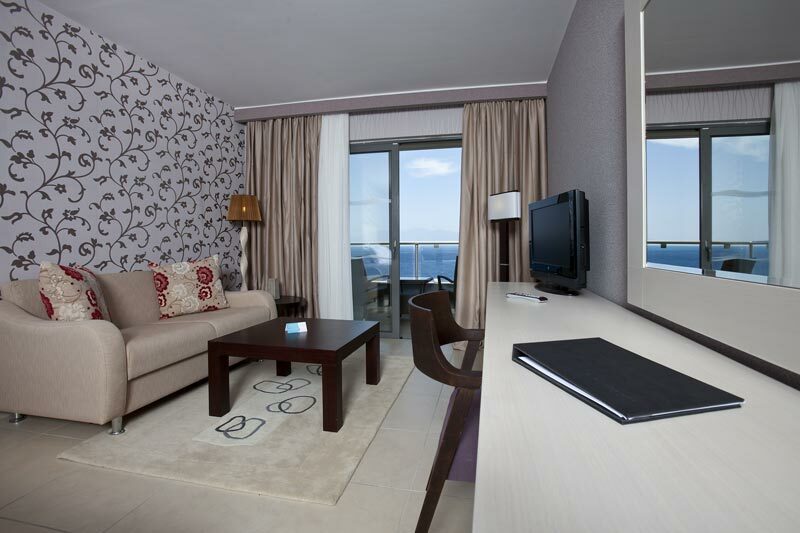 Our Executive junior suites identical to our junior suites and they are situated in the first row of the hotel overlooking just the Aegean Sea. Their occupancy is up to 3 adults. 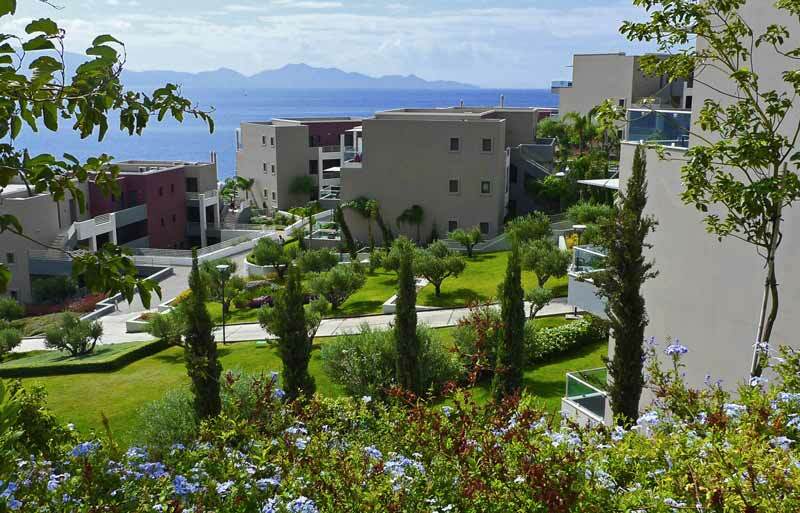 Our superior suites are more spacious approximately 40 m² and they offer sea or mountain views. They have one separate bed room and a living room. Their occupancy is up to 4 adults. Individual unit of air condition. LCT TV & satellite TV channels. Safe (in each room free of charge). Coffee & tea make facilities. Blissful bed mattress and excellent quality pillows. Cozy bathroom with bathtub & hairdryer. Mini bar available on request. Room service available from 07:30 to 23:00. Meeting room up to 50 persons. 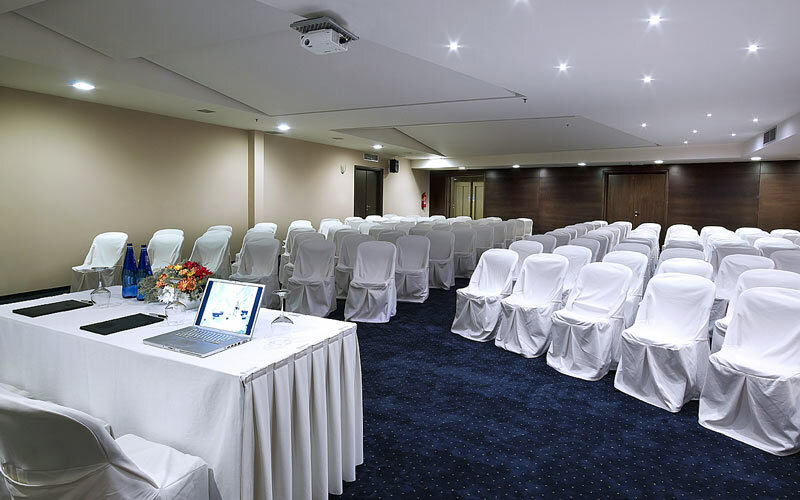 Conference room of 250 seats with all modern audio visual equipment available for congress and conferences. We will help you to arrange your wedding party or any other event you wish. Our principal restaurant David’s Hall, situated in the main building next to our lobby area, is open daily for breakfast, lunch and dinner. 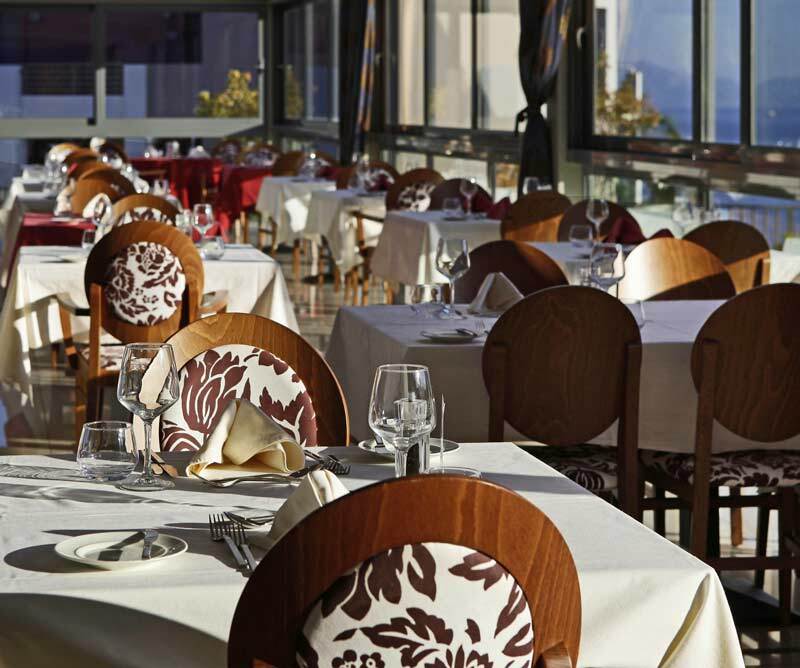 It offers rich buffets with international cuisine enriched with Greek and Mediterranean dishes. 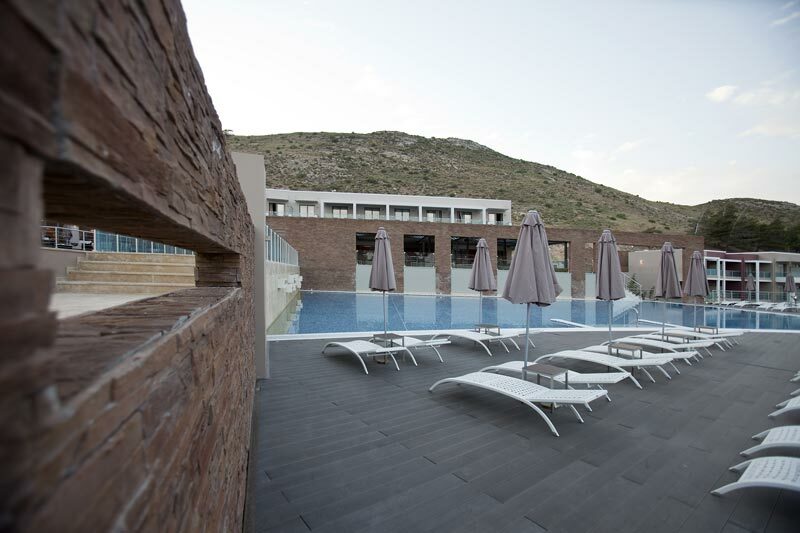 Its wine list includes an extensive variety from Greek vineyards and some imported wines. Smart casual, not accepting short trousers during dinner. 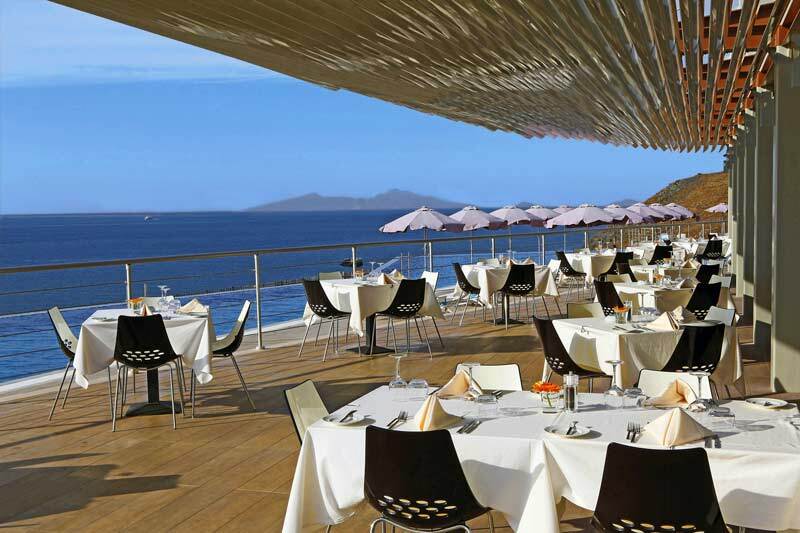 Kulinarium restaurant is situated in the level of hotel’s infinity pool overlooking just the blue water of the sea and the sky! There is an interior area and an open air veranda for calm breakfast, delicious lunch and romantic dinner. In the morning, our guests may taste a buffet style American breakfast. 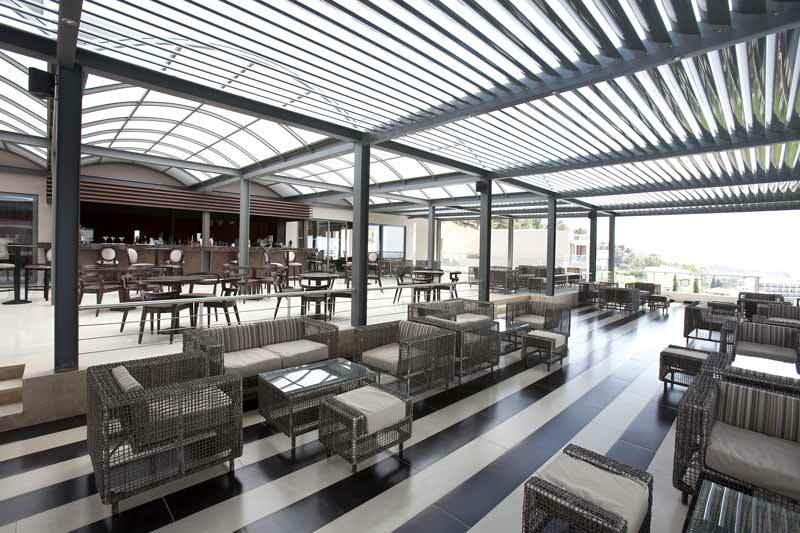 Later on, Kulinarium’s menu presents Greek and Mediterranean cuisine enriched with international classical recipes. During the day a delicious snack menu is available. Later when the night comes, we suggest a romantic candlelight dinner with wine of our extensive variety from Greek and imported vineyards. Casual during day & casual chic for the evenings. Located in the main lobby area serves a wide selection of alcoholic brands and offers an overview of the main swimming pool of the hotel. Should someone desire the perfect spot for a unique view of the Aegean Sea, must spend enough of his/her time enjoying an exotic drink on a couch of this bar. 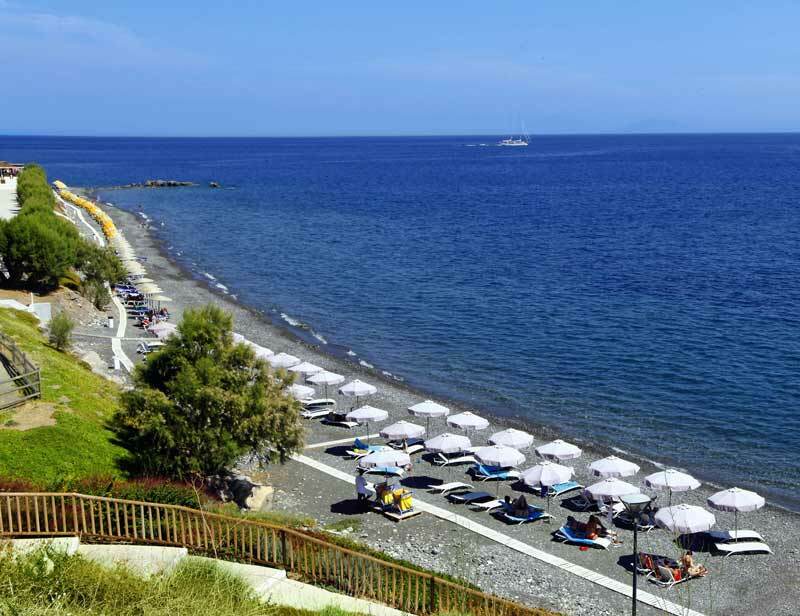 Located literally over the seashore, Mediterranean bar offers all kinds of drinks to its clientele. 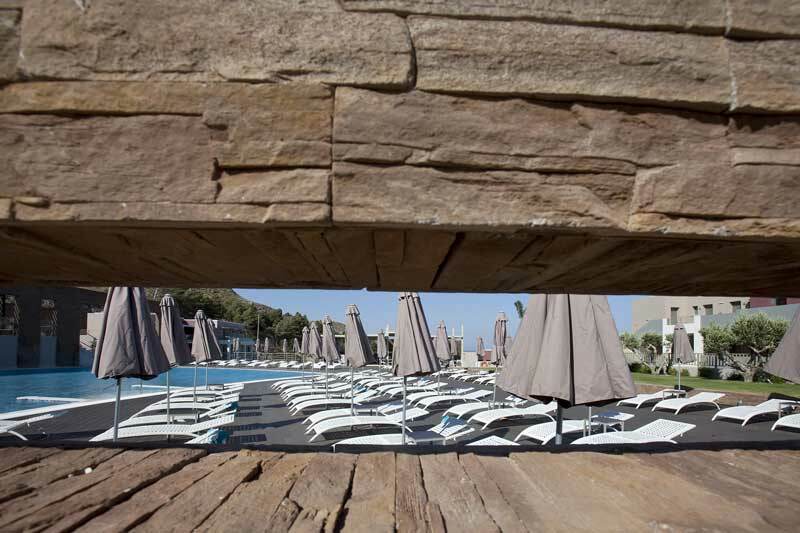 An alternative solution is the right choice for those who are seeking a quite spot, to enjoy the sun and the crystal clear water of the main swimming pool. 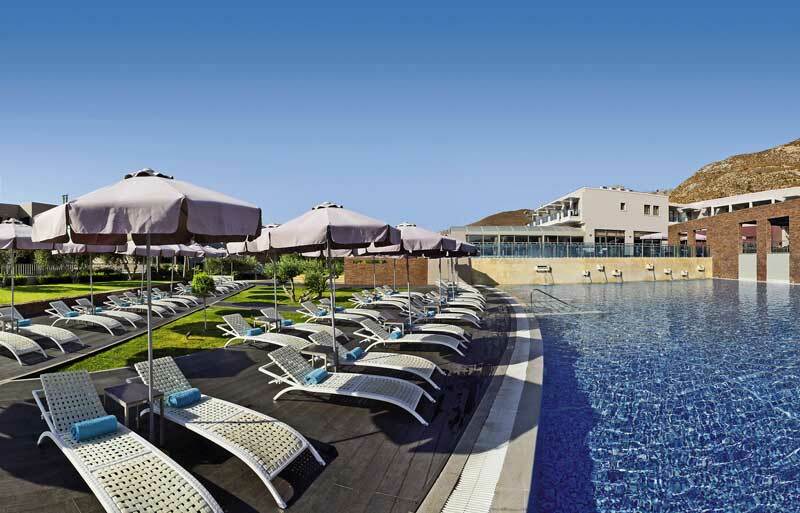 The hotel offers a great selection of day & night entertainment & activities in a weekly basis. Hotel offers a tennis court, multi use court which turns into mini football court & volley ball court. Is a place of absolute tranquility. When you can tear yourself away from the magnificent view, visit the hotel's spa situated in the main building next to the conference hall. Our serene and captivating spa features soothing water sounds and diffused calming lighting. It comprises 3 treatment rooms, beauty & hair salon and a retailed spa shop. 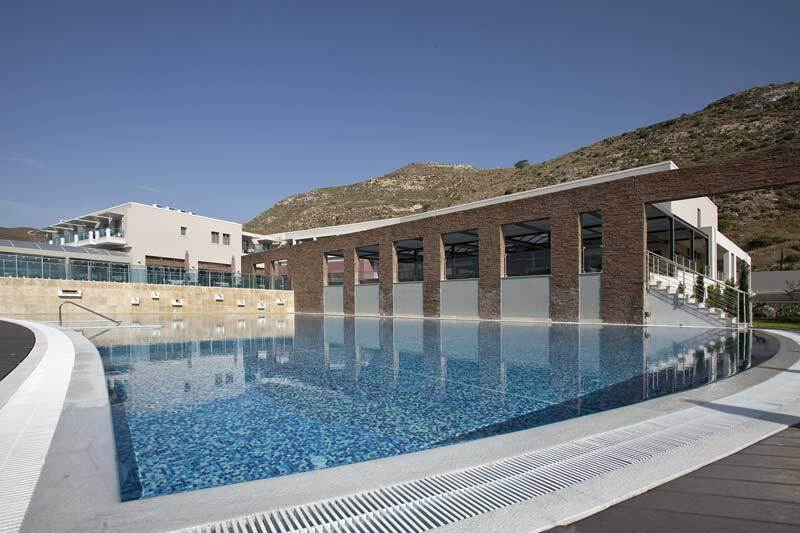 The indoor relax swimming pool (heated), the gym, the sauna and the steam room we demand a small fee of 10,00 € per Person per day. The fitness room is free of charge. 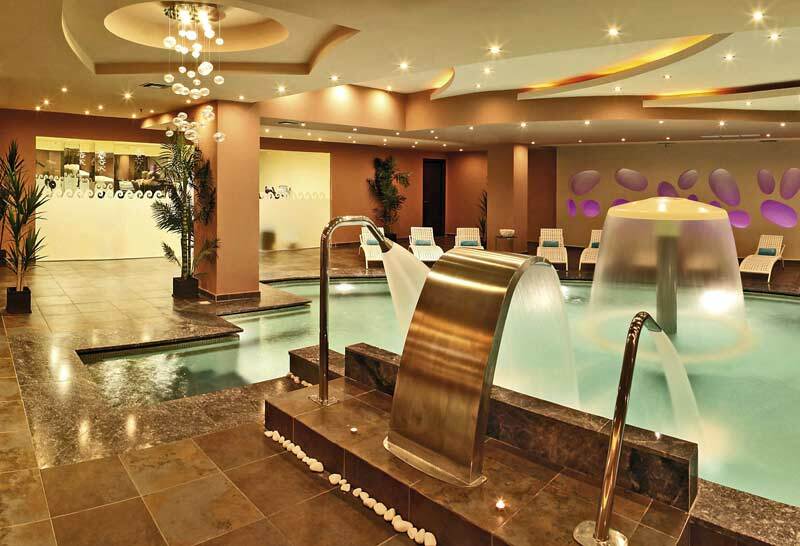 The Therme Spa was created out of our passion to combine the benefits of wellness, pampering and relaxation with the commitment to luxury and personal attention. 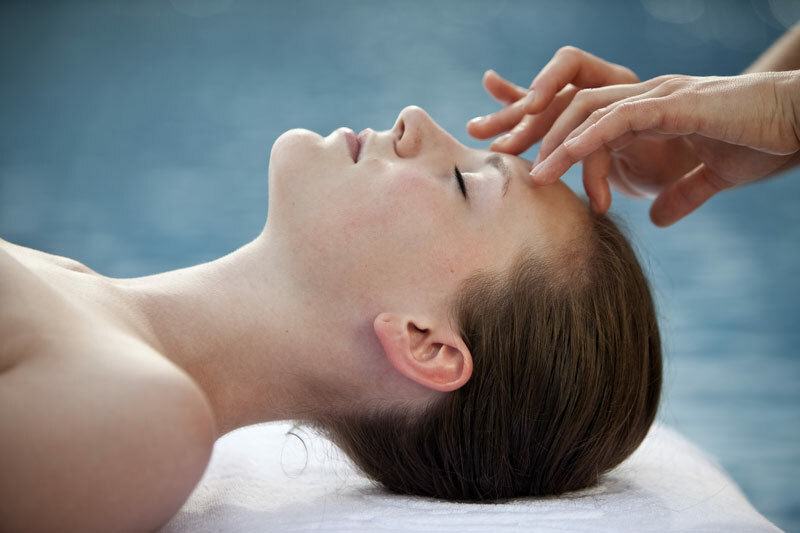 A selection of excellent quality treatments are available at our spa ranging from Thalassotherapy and signature treatments to massages, facials, beauty salon services and more. We are pleased to introduce THALGO in our spa menu, the French spa brand devoted to the revival of Beauty Rituals specially designed to take discerning spa goers in a wonderful Sensorial Journey. 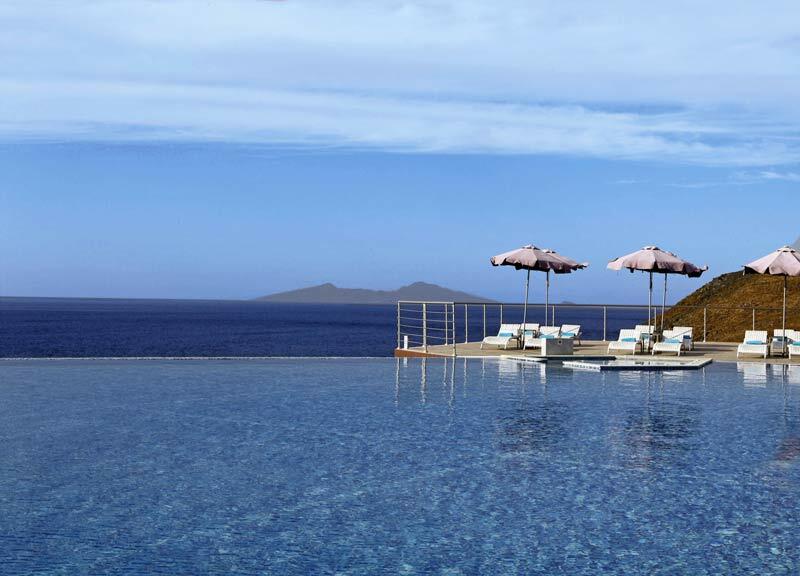 Our brand new spa service is overlooking the big blue Aegean Sea and is situated in the edge of the hotel, in the level of our infinity pool. Our well trained spa therapists are delightful to offer massage rituals in our comfortable open air massage pavilions. 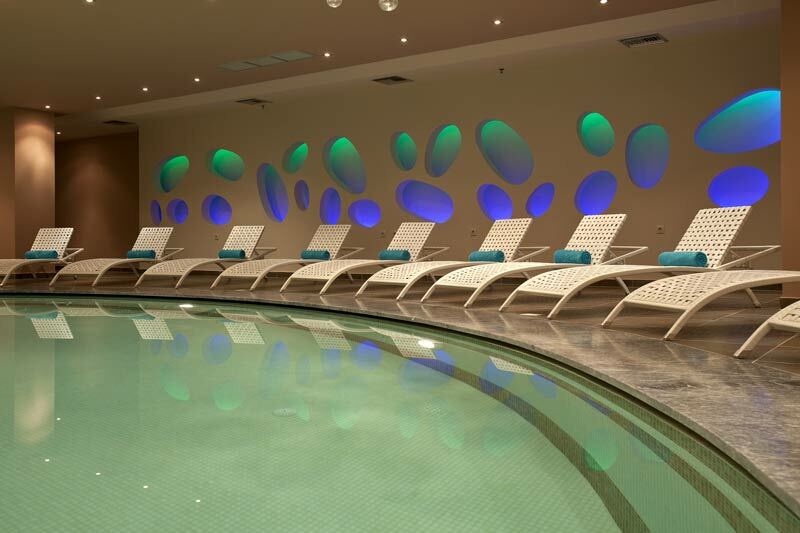 Reservations can be arranged by our Therme Spa reception. © Nostalgia Travel  / A Class Hotels / Ag. Fokas.